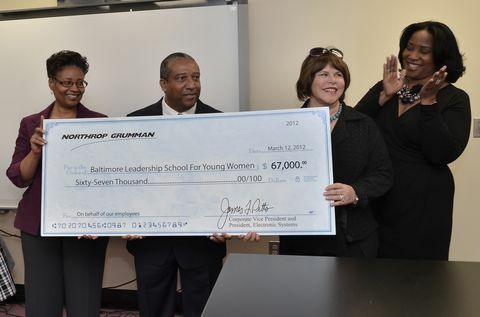 BALTIMORE, March 14, 2012 -- Two new science, technology, engineering and mathematics (STEM) laboratories have been opened at the Baltimore Leadership School for Young Women (BLSYW), thanks to a grant and in-kind support from Northrop Grumman Corporation (NYSE:NOC). A ribbon-cutting ceremony took place on March 12 at the BLSYW campus on W. Franklin St. downtown. Ted Imes, director of community relations for Northrop Grumman Electronic Systems, presented a symbolic check for $67,000 to BLSYW founder and board chair Brenda Brown Rever and Principal Lorna Hanley. BLSYW students joined Imes to cut the ribbon and, then entered the new STEM labs. "The Baltimore Leadership School for Young Women is leading the way in providing opportunities for young girls interested in pursuing technology careers," Imes said. "Northrop Grumman's partnership with the school supports our long-term goal of increasing the number of minorities and females in engineering." BLSYW is a Baltimore city public charter school, publicly funded and open to all students with no admission testing or screening. The school is operated in partnership with the Foundation for BLSYW, which has developed relationships with organizations and companies such as Northrop Grumman to establish new programs, create new educational opportunities and provide additional funding and human resources to build, operate and sustain BLSYW programs. "Our girls represent the next generation of leaders in science and technology," said Maureen Colburn, executive director of BLSYW. "Northrop Grumman recognizes the potential of this talent." The new labs were designed with in-kind support from the Northrop Grumman Facilities Department, led by Chip Mitchell and Juliann Biggs, utilizing the Anne Arundel Community College Regional STEM Center as a baseline. They will be outfitted with equipment for science classes suitable for classes ranging from sixth to 12 th grade, paving the way for the first BLSYW class to enter their high school years this coming autumn. BLSYW opened in 2009 with 120 students, all in sixth grade. Each year, it adds another grade, welcoming new sixth-graders as the earlier classes move upward. There are now 285 students in sixth, seventh and eighth grades. The first class will graduate from high school in 2016. Northrop Grumman helps the school set goals for the engineering portion of its STEM focus. The company is also involved in assisting with professional development and enhancing curricula that support engineering on both the middle and high school levels. Northrop Grumman has a longstanding commitment to STEM education, based on the nationwide need to educate more students to meet future workforce demand for STEM skills. The company's STEM-related programs include the annual Northrop Grumman Engineering Scholars program, which provides academic-based scholarships to promising high school seniors who plan to pursue a career in engineering; Teachers and Engineers for Academic Achievement (TEAACH), an internship program for middle school math and science teachers; and Worthwhile to Help High School Youth (WORTHY), a mentoring and scholarship program for high school students. The first BLSYW students will become eligible to apply for WORTHY next year.